If you’re a NOOK user, you can read Soul Thief on your device now, say the folks at Barnes & Noble. In addition, you can “rent” it for free for an hour in any Barnes and Noble location while you’re on the premises. The book tour will launch in June in NYC, and then cover most of the Midwestern/Eastern states, including the cities of Columbus, Chicago, Toledo, Philadelphia, and Indianapolis. In addition, there are late summer dates for Texas, Oklahoma, Kansas and Missouri. The second in the series, Soul Keeper, is due to be released in 2013. 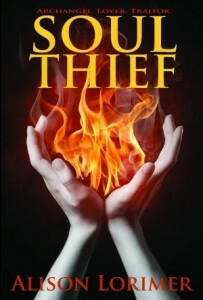 Find Soul Thief on Nook here. I am so glad that you're here! Welcome to THM, the best internet magazine dedicated to your health, wellness, relationship recovery and matters of faith. We encourage you to write into us through email, and let us know how you are, and how we can help. Alison is a pastoral counselor with a Masters in Divinity. We offer prayer, helpful advice and practical suggestions to everyone. If you like the Today's Healthy Minute articles you read, please post them with your favorite social media with the icons at the bottom of the page, and subscribe! It's free and we never send spam; Alison says "I have no time to write spam....and I don't know for sure what that would be." We don't sell our contact information, because we hate it when it's done to us. Need someone to talk to? Have a question or a problem? Email Alison directly at [email protected] We do not open attachments or photos. Feel free to just ask your question or tell your story. I (Alison) will either respond to you via email, or in the blog without any information about your identity. We get up to several thousands of hits a day; don't be surprised if your reply is within a working week, perhaps less. Copyright © 2019 Today's Healthy Minute. All Rights Reserved.The Magazine Basic Theme by bavotasan.com.